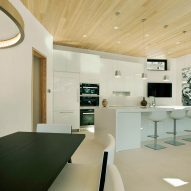 American firm Studio B faced challenging site conditions while conceiving this contemporary Colorado dwelling that sits atop a concrete plinth. 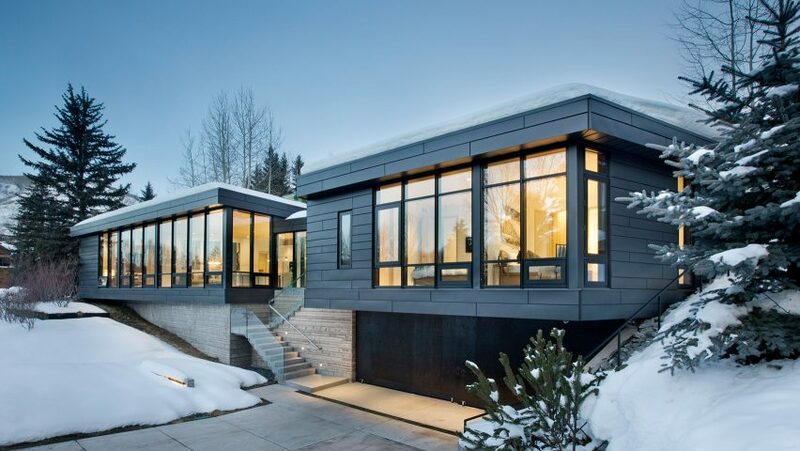 The Zale Residence is situated on a sloped, angular property in the mountain town of Aspen. 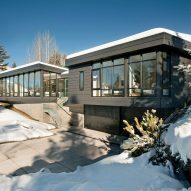 Located within walking distance to downtown, the home enjoys "ample sunshine and great views to Aspen Mountain". The property faces an active street and is bound on three sides by neighbouring buildings. 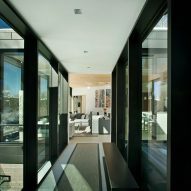 In response to the site conditions, the architects elevated the home off the ground – a strategy that enabled privacy and views for the occupants, while also conforming to a building restriction. 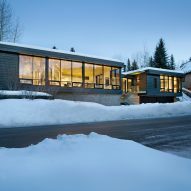 "A constrained property, a complex history and a one-storey requirement define this 2,500-square-foot (232-square-metre) residence," said Studio B, a firm with offices in Aspen and Boulder, Colorado. The home consists of flat-roofed, zinc-clad volumes that sit atop a plinth made of board-formed concrete. One side of the ground level is occupied by a garage. A concrete stairway with glass walls leads to the front entrance, which delivers visitors into a central corridor. The corridor connects two wings. One contains the kitchen, living room and master suite, and the other houses two bedrooms and a family room. The wings wrap around a compact courtyard at the rear. 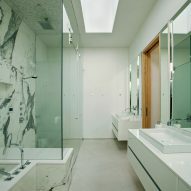 Interior rooms feature floor-to-glass windows, which usher in ample daylight. "Sectional differences and an open-plan capture natural light throughout, with the hidden rear terrace embraced by the architecture," the team said. 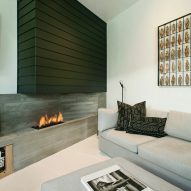 For the interior decor, the team used charcoal overtones to complement the exterior material palette. 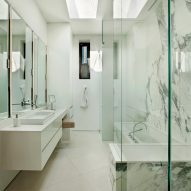 Finishes include light-textured porcelain floors, grey-veined marble and premium drywall. 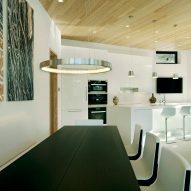 To add warmth, wire-brushed cypress was used for ceilings and interior doors. The home is also filled with art that "reflect the clients love of travel". Other residential projects by Studio B include an addition to a Colorado riverside home wrapped in weathered wooden boards.